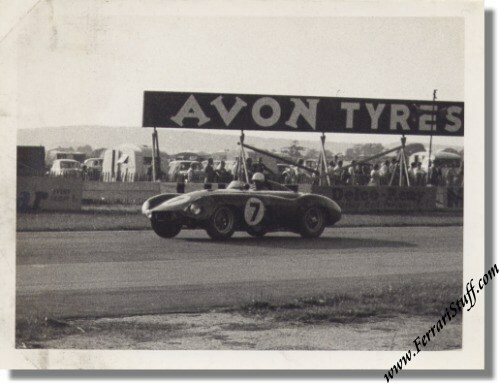 Vintage 1955 photo of Ferrari 750 Monza S/N 0514M - Goodwood 9 Hours - Jonneret / Wharton. This is a vintage photograph of the Ferrari Monza 750 of Ken Wharton & Jacques Jonneret en route to a DNF in the 1955 Goodwood 9 Hours. The car was owned by Ken Wharton who got killed in it at Ardmore, New Zealand on January 12, 1957. One source mentions no further racing activities with it but we found some information that later on the car was apparently owned by Bill Thomasen of New Zealand who raced it quite extensively in NZ during 1960 & 1961. After this, the car got a Chevrolet Corvette engine implanted and now seems to reside at a NZ museum. The photo measures some 11.5 x 9 cm or 8.5 x 6.5 inches.